Triple Modern GP weekends are both exhilarating and intimidating for me. On the one hand it’s great seeing how the format is developing and growing. Watching strong players play my favorite format while the commentators (almost) understand what is happening are the only reasons I ever watch video coverage. The flip side is that the amount of data these things generate is vast, and trying to make sense of it is prohibitive. I was actually hoping to start rolling out the results from testing the safety of banned cards returning this week. However, I found a fault in my methodology that has set me back a couple weeks. Instead I’ve got a couple shorter topics to cover this week. The data from the GP Weekend has been helpfully collated by Frank Karsten, so I’ll be looking at that in terms of a problem that I’ve noticed in Modern. Before that however, an update on my ongoing Spirits project. I’ve been working on my Spirits deck from last week almost exclusively. While I still don’t have the optimal list together, I do have enough information to explain what I’m missing and where the deck sits in Modern’s metagame. The short version is that it likes durdly metas and needs another good two-drop. The long version is why this is an article rather than a Tweet. UW Spirits preys on a metagame full of mana efficiency-dependent, interactive decks. In English that means it wants to play this Jeskai deck every single round. Spirits demolishes decks that rely on efficient one-for-one interactions to gradually pull ahead of their opponents. It struggles against fast aggro and decks that lack Spell Queller targets. Spirits is capable of locking Jeskai out of the game using hexproof. A pair of Drogskol Captains is effectively a hard lock but even a Rattlechains or two can be enough. Current Jeskai Control lists work by using a high density of mana-efficient answers to run their opponent out of threats. They don’t run much card draw because what Jeskai is ultimately about isn’t about card advantage but card velocity. When they don’t get to power through cards, the deck doesn’t work. When Jeskai’s one-for-ones aren’t actually one-for-ones then the deck simply fails. It can sometimes get there by being a clunky Burn deck, but that’s not typical. Giving everything hexproof is normally a free win, as Bogles has known for years. However, even just successfully protecting a creature with Rattlechains can be enough to irrevocably pull ahead, since that’s one spell down and two more are required, which causes the velocity engine to run down. The Jim Davis list I linked above has exactly 12 maindeck cards that don’t care about hexproof, and Cavern of Souls drops that to 4. Even if they play sweepers, which most decks don’t, you have Queller and Selfless Spirit. This often plays out similarly in the BGx matchups. Those decks are full of removal as well, and Spirits just fly over Tarmogoyf. What makes those much harder than Jeskai is that discard ignores hexproof, so you cannot just wait for the right opportunity to resolve threats; you have to pump them out quickly. Spirits is capable of this, but it’s not optimal. If you force Spirits to really grind it falls apart quickly. For this reason, other answers are very important to the deck. While still favorable, BGx and similar black-based fair decks are much harder than their blue brethren. The problem is that this system is very much a house of cards. If hexproof is irrelevant then the deck’s virtual card advantage disappears and you start to struggle. For Bogles hexproof is just a tool to build an immense threat; in Spirits it is the reason you run Captain and Rattlechains. If you can’t generate a lot of dead cards for the opponent, you’re left with a relatively anemic clock. Your best goldfishes are turn five kills and barring assistance from your opponent the only way to win on turn four requires Geist of Saint Traft. That isn’t the whole story of course, because Mausoleum Wanderer and Spell Queller in addition to normal counterspells give the deck considerable game against decks that have to resolve spells to win. As such Spirits also crushes Living End and Tron. The problem is that aggressive decks play cheap creatures Wanderer can’t hit and Queller and counters are too slow. Merfolk also has this problem but it mitigates it through exponential creature growth which Spirits can’t match. Therefore, I don’t think that Spirits can currently compete for a spot in the tierings. What it will do is spike tournaments. Spirits is a metagame deck that will just crush some metas and fail miserably in others. When slower decks and Tron are at their peak, Spirits will ferry you to victory. More aggressive metas full of Infect and Merfolk will overrun you. Put simply, Spirits is the perfect choice for a meta of Jeskai, Scapeshift, Tron, and BGx, but should be left home in more aggressive tournaments. The problem is that Spirits is missing its last two-drop. It needs another two-mana flier with upside to complete the deck. Right now it relies too heavily on its one- and three-drops for its offense and as a result it feels very clunky. You almost never want to play Rattlechains just to have a threat. Sometimes you have to, but it feels bad. It wants an expendable two-drop that is nice to have but which you’re more okay trading for Lightning Bolt than you are with Selfless Spirit. I’ve tried a lot of cards to try and fill that spot and unfortunately there isn’t another flying two-mana spirit. Anafenza, Kin-Tree Spirit and Spirit of the Labyrinth are both fine cards, but they don’t really fit into the deck. They’re just not an integrated part of the strategy and you always notice how tacked on they feel, despite both having good upsides. Eventually there will be a card that fills this hole, but until then the deck will always feel incomplete. I was playing Deprive because it was much better than Mana Leak against Tron, but it’s a nonbo with all the three-drops. Which counter you run will depend on your local meta and personal preferences. Eidolon was surprisingly good against a lot of decks, but was also alarmingly fragile. The combo with Spell Queller is a bonus. Faerie Conclave instead of Celestial Colonnade because you didn’t hit six mana often. Mutavault not flying ended up a deal breaker. The comments were right last week—Supreme Verdict is very good out of the board. It makes Eldrazi much more favorable and gives you hope against other aggro decks, though you’re still an underdog. Going more transformative is too space-intensive, so lean on Selfless to protect your board. So enough with the Spirits, let’s look at the GP weekend. Three Modern Grand Prix in one weekend generate a lot of data. Three Top 64 lists worth of data to be precise. That’s a lot to go through. Fortunately, I don’t have to because Frank Karsten has already turned that raw data into something usable. I’m going to link to his Tweet again because I’m paranoid about giving credit where it’s due, and then I’m clipping the whole chart so that we’re on the same page. What Karsten has done is use an aggregation method to weight decks based on their overall performance and population. The in-depth explanation is linked in the chart, and I’ll make it easy for you. There’s a lot to go through here, so let’s make it more digestible. This is actually kind of eerie. The only deck from our top ten not on Karsten’s list is Merfolk replaced by Ad Nauseam. Frankly, I’d say that’s an endorsement of the validity of our methods. Well done, Sheridan and Jason. My favorite deck sits at 13th, irritatingly, behind Abzan Company and Elves which I’m not surprised about for reasons that will become clear. Affinity was the winningest deck of the weekend, despite not actually taking down a title. This isn’t too surprising—Affinity is one of the best game-one decks out there and the pilots have to dedicate themselves to the deck. If you’re facing an Affinity opponent at a GP, assume they’re a master. Practiced players with a powerful deck are just a recipe for success, and there were a lot of Affinity decks in the listings. The most interesting Top 10 resident is Ad Nauseam. A Tier 2 deck according to our July data, it’s Tier 1 based on this list. The deck is well known for being powerful but inconsistent and vulnerable. More so than any other Modern combo deck, if it doesn’t draw the namesake card it does nothing. If it doesn’t resolve said card, it does nothing. Even if it does do something, prepared players can beat drawing their whole deck anyway (vialing in Spell Queller on a charged Lightning Storm is really good). However combo players, especially GP combo players, are dedicated to their craft and came ready to beat the hate. I also know that their nightmare card Slaughter Games was almost completely absent. The first lesson is that the most important thing in Modern is to know your deck. Having a surprising deck or game plan is still valuable even in this internet age. Knowing your opponent’s plan and countering it is the most powerful sideboarding strategy around. The other is never to discount your opponent. Just because you think a deck is bad doesn’t make it so. You can’t prepare for everything, but try to be aware of as many decks as possible and have a plan to win. Take a couple minutes and just look through that listing. What do you see? Now think back to the coverage. What did LSV and Gabby chatter about frequently (that was actually relevant to this article)? Stuck? Here’s a hint: It’s one of the unique features of ChannelFireball coverage. That’s right. Fact or Fiction. Specifically the question about whether a fair or unfair deck would win GP Indianapolis. Now in reality a fair deck won (yes, Burn is fair), but what I’m asking you is which deck type won the weekend? Long-time readers know that this is a trick question and the answer is neither. There is a third category, the “fair” deck, decks that do unfair things fairly and fair things unfairly. 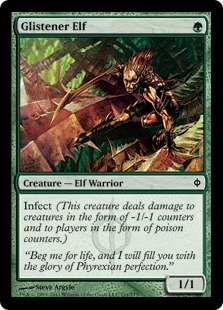 Examples include Tron’s mana generation, exploiting mechanics like Infect, and Affinity’s explosiveness. When I look at the top 10 decks I see two truly unfair decks (Dredge and Ad Nauseam), three fair decks (Jund, Jeskai and Burn) and the rest are “fair.” This is significant. There has been debate in the community about the actual health of Modern and the unfortunate reality is that these results back up the claims of the unhealthy camp. The decks that are winning are less than fair and non-interactive. Unfortunately it’s just easier to play Gotcha! in Modern than to play answers. However, I’m not worried. I know that the noninteractivity looks bad, but it isn’t as bad as it looks. Despite everything, fair decks are hanging with the less fair ones. What we’re seeing is a midpoint of a format in flux. We’re still adapting to the loss of Twin and the stability it provided as the best deck. It’s been around since the beginning and it is going to take some time to adjust. You see, when you look around the list there is incredible variation and diversity. Whether or not deck diversity is a measure of health is not the point, but rather that it speaks to how many players see their deck as being viable—decks that weren’t viable when Twin was around. Everyone is still clawing over Twin’s corpse and so I say we still haven’t seen the “real” post-Twin Modern. Which brings me back to the top ten GP decks. I believe we’re seeing so many “fair” decks take home so much success because fair decks are still trying to drag themselves out from the Twin era and are struggling to comprehend the new reality (Plato’s Cave, etc., etc., philosophy). The explosion of decks is overwhelming and in trying to be the answer deck they’ve spread themselves too thinly, which is letting decks that they really should prey on slip through. The “fair” decks aren’t that hard to beat, but they thrive when players don’t have the right answers. This might also explain why Jeskai lists are so focused on the one-for-one game and are neglecting their sweepers, or why Jund lists are leaning ever more heavily on Scavenging Ooze as a catchall card. Jeskai is worried about maximizing Nahiri more than being a control deck and Jund is trying to play too many broad maindeck cards. They’re defining the metagame too broadly and ironically are missing the forest for the trees because they’re mentally overwhelmed. Trying to build a deck to beat everything is too burdensome. They need to simplify. What I would suggest is to target the most extreme decks and build from there. If Jeskai focuses on beating Infect, they will play full sets of Path to Exile and Bolt. This will incidentally go a long way to beating Death’s Shadow and Affinity. This takes care of most of the “fair” decks. Then they focus on the most extreme combo deck, Ad Nauseam. Then you look for more general answers for when plan A doesn’t work. Mike Flores long ago recommended that you target your deck against both ends of the metagame and hit everything in between by accident. I think it is time to recognize that Modern is too vast to comprehend and deckbuilders need to adjust their aim. I think once the fair decks regain their footing and relearn their place and what they need to answer things will settle down. The rise of Jeskai is an encouraging sign that the influx of “fair” decks can be contained and controlled. It will just take some more time to adjust. Modern had been shockingly stable for a very long time. That kind of inertia is hard to overcome. A little more discipline in deck construction and remembering the lessons of Magic’s history should help solve the problem. Next week will either be another edition of the Beginner’s Guide or (data willing) my results on Stoneforge Mystic. Until then, see you in the comments. Let me preface this by saying I recently got top 8 at regionals with my own build of spirits, and had only lost a single Game by the time I hit top 8 before finally losing a round. Perhaps your search for the proper 2 drop isn’t looking in the right places. My deck was successful because I realized something about spirits. Spirits is a deck that’s looking to cut off as many axis’ of play for the opponent as is possible. Everything has flying, so you cut off most blocking. Almost everything has flash, significantly dampening anything at sorcery speed, a lot of Hexproof to turn off removal. This is what makes their countermagic so powerful. Basically they are forced to try to race you. Which is exactly where you’ve ended up struggling. You aren’t preventing a race. I also only ran one nebelgast herald. But I did run 4 topplegeist. everyone dismissed that card but let me explain. “When spirits are ahead they are one of the best decks at staying ahead” to quote another writer. If they stay ahead almost unshakeably, your goal is to get ahead in the first place. One of the best ways to do this is just raw density of 1 drops. The ability to tap down a blocker, or if you have rattlechains, an attacker, swings the tempo and race math massively, and given an anthem (or a lord) a 2/2 flyer is very very relevent. Even just as a chump blocker to buy two turns (tap, then block) your deck has no lack of value to be left wanting from a relatively low impact card and has a flying clock to punish those lost turns and tempo from your opponent. I strongly suggest giving it some real testing. It opens up really powerful plays like wanderer, topplegeist topplegeist swing for 3, captain, swing for 7. Thanks for the article! Another creature I would strongly recommend testing is Thalia, Guardian of Thraben. We know she’s a well established soft control piece that aids spirits in doing what it already does–obtaining and maintaining tempo. I think the value of Thalia is that not only can she add to your ability to interact successfully with BG/x decks, but she also has first strike, which will help shore up your aggro matchups. I like Thalia, and that effect would be extremely strong in this deck. The only problem is that she isn’t a spirit and doesn’t fly. I think she has a place in a deck similar to my Spirits list, but it needs to be less dependent on the tribal synergies. And you couldn’t run Cryptic Command, which might actually be fine. My sincere opinion on Spirits is that it is just a bad merfolk overall. Spell Queller is strong, as is Mausoleum Wanderer. But the rest is just too clunky or weak if the synegy is not assembled, and the payoff is not even that big, if you compare again to merfolk. – Anafeza is better as a combo enabler, but as a value creature it’s not that good. – Spirit of the Labyrinth also is not that good, there are matchups where it might be good, but in other matches it just a Blade of the Sixth Pride. – And because the quality of the spirits is low, Rattlechains ends being bad, the best thing it does is protect spell queller from removal. Basically the deck is trying too much to force synergy to a point that is using cards that aren’t that good at all. Unless the payoff synergy is very strong, it’s not a nice idea to use subpar cards to acheive it. In open metas you are right, it is bad Merfolk. However, it has certain good matchups that are much better than the Merfolk’s, so when the time is right it will be better. A metagame deck through and through. I have to get some more reps in with the Spirits list before I really make up my mind, but while Spell Queller seems to be quite the card, I feel that your shell has a bit of 3-drop bloat (though that may be difficult to fix given the creature selection). I also think that creatures like Anafenza and Eidolon of Rhetoric are unimpressive – I’d rather double down on mass fliers, since there are plenty of decks out there that simply can’t block them. Regarding Merfolk posting a good-but-not-great record-based metagame percentage… I’d wager Affinity being at the top and a lot of lists opting to not include Recalls (as evidenced by the reports on the Merfolk thread on MTGSalvation) have a lot to do with it. Affinity is always present at big events, and it’s always a mistake to cut your Recalls if you’re going to one, but for reasons that mystify me, people just. Keep. Doing it. There’s definite three-drop bloat, and that’s why I’m pining for a two-drop spirit who flies. If there were another good flier I’d probably play it but there really aren’t options. A Vryn Wingmare that costs one less and is a spirit is my ideal choice. That was exactly what I was implying. Between Affinity and the other “fair” decks I’m not surprised Merfolk struggled. I didn’t know about the Salvation reports, but I am always stunned when any deck does that. After years of articles warning players against free-riding on hate cards, and frequent reports lamenting the choice, people still make the mistake. I guess there’s something to be said for learning it on your own but COME ON ALREADY! Preach, brother. How many times can people keep making the same mistake? As for Spirits… yeah, I think we’ll just have to wait on the cardpool hopefully getting a bit deeper. Hey David, great article. As a long time Burn player, I think it might be better to classify the deck as “fair”, as opposed to fair. To agree with you, a “fair” deck does fair things unfairly. Burn’s unfairness comes in the form of how it deals damage. The majority of damage from Burn is unpreventable; it comes directly at your face, instead of in the form of repeatable creatures. We trade possible repeatable damage for guaranteed one-time damage that can’t be avoided (barring, of course, counterspells). This explains why the appropriate type of hate (lifegain or hexproof) followed by a medium-to-fast clock is so hard for the deck, in the same way that hate can be backbreaking for Affinity or Infect, two other “fair” decks. I would call Burn more “fair” than Affinity, although I think both fit the category well. The distinction for me is that the scale isn’t determined by power. It’s about how a deck approaches the game. Burn is inherently fair because it plays a fair game and achieves a fair end. It may feel “fair”, but trading a card for a card (if you value life as the Philosophy of Fire states) is a fair strategy. The unfairness stems from how poorly positioned most decks are against Burn thanks to their reliance on fetch/shocklands for the manabase. It certainly has a lot in common with “fair” decks in terms of losing to hate cards, but that by itself doesn’t shift it from fair territory. Attacking from a different angle is still fair. I would totally agree with you that “fairness” isn’t determined by power. I was arguing more that the fact that Burn approaches the game by making their damage unpreventable at the cost of repeatable (thus requiring hyper-efficient 3 damage-to 1 card spells) is what puts it in to “fair” territory. In the same way Affinity uses explosive speed, Burn uses non-preventing damage. Having said that, I totally see where you’re coming from and respect your definition. Thanks for the reply! What about going to Jeskai Spirits and jamming 4x Eidolon of the Great Revel? I mean, it’s not a terrible card as any Burn player can tell you, and Spirits is fundamentally a Vial deck, which is where Burn players board out the Eidolons. And what happened to Cavern of Souls? Or is uncounterable just not that important?